See where you are in your cycle today: from your cycle day, cycle phase and fertility status, to how long until/since ovulation, and more. The fertility chart simplifies viewing your key cycle dates! 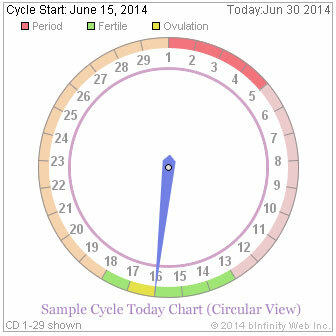 Track and chart every day of your fertility cycle, then automatically see your stats, cycle forecasts, way more. Free, online & smartphone - MyMonthlyCycles.com!